Schlosser Designs: Happy 100th Post! I hope you like it! I put together a book for you! It's the Project Recipe Book! I would have loved to have this book when I was first starting out with card making. It can be really hard to come up with different layouts for your cards. It's all black and white layouts which make it easier to add colors to your projects. Lots of times I'll look at a card and decide I don't like it. Being the designer I am, I then ask myself why I didn't like it. It's usually that the colors they used are not my favorite. When I look at it again I like the layout, just not the paper they used. So, this is why this book is very simple to use. Just find the layout you like and add your own colors. This book has 40 different layouts that are easy to do. 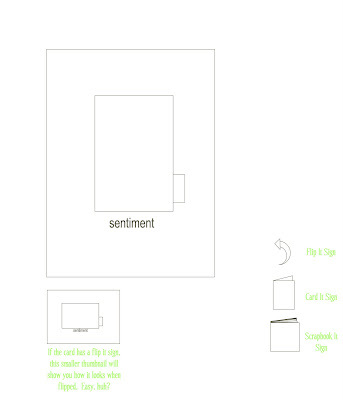 It will also tell you whether the layout will work for a scrapbook, card, or both. Here's a sample image from the book, with my notes to explain. Click on it to make it larger to read. This is really neat Erin. Exactly what a non-creator like me needs. It is officially on my wish list! how fun! this is such a great idea - i love being creative, and i find i always do a better job when i have a starting out point. thanks!